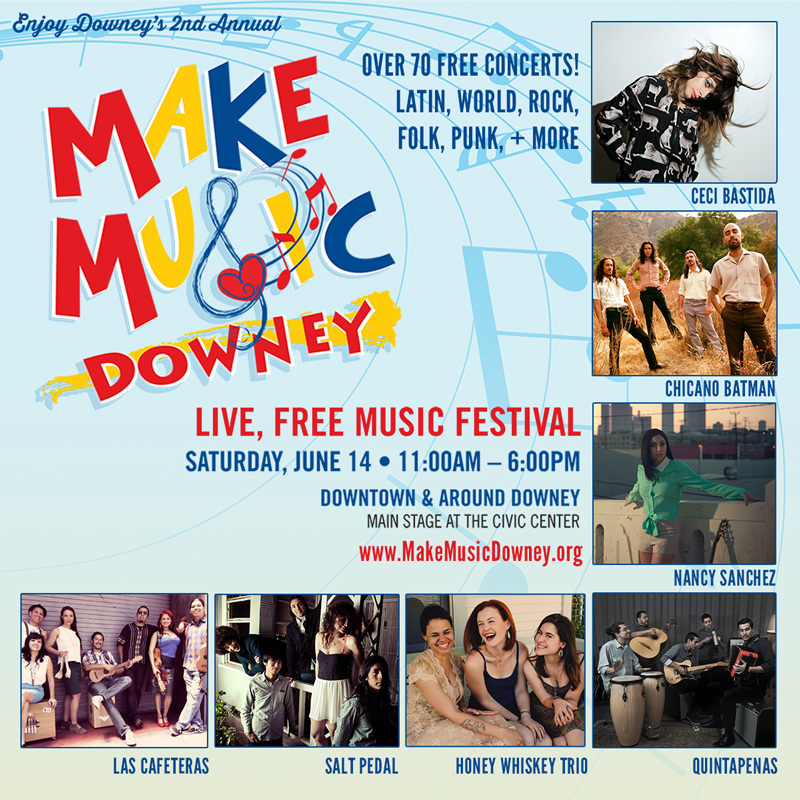 June 14th is our free, open and public music festival MAKE MUSIC DOWNEY. More information will be released soon, but we have an exciting line-up of artists all over town, and on the main stage at the Downey Civic Center. With over 70 music performances scheduled, it is sure to be a mosaic of musical sounds across the center of the city, with every genre represented: Latin, World, Rock, Folk, Punk and more. Local hit groups such as Las Cafeteras, Ceci Bastida, Chicano Batman, Salt Pedal, QuintaPenas, Nancy Sanchez, Downey’s own Honey Whiskey Trio and many others. Our venues include the main stage outside of Downey City Hall, the Eclectic Roots stage at the historic city hall archway, downtown eateries such as Mambo Grill and Porto’s Bakery, arts and entertainment venues The Epic Lounge and Stay Gallery, as well as First Baptist Church of Downey, the Downey Music Center and other outdoor spots. The day kicks off at 11AM, ends at 6PM. For more information visit www.MakeMusicDowney.org.